Ray Kroc in front of one of his restaurants in 1955. The tale of how a middle-aged Chicago salesman named Ray Kroc turned a California hamburger joint called McDonald’s into a global empire has entered American folklore, and veteran journalist Lisa Napoli views it from an intriguing angle in her lively double biography of Kroc and his third wife, Joan. Napoli’s prose at times verges on purple, and her book’s organization can kindly be described as impressionistic, but there’s no denying the storytelling appeal of combining Ray’s relentless expansion of the McDonald’s brand with his 13-year pursuit of a charismatic blonde 26 years his junior while both of them were married to others. Once he finally gets her to the altar in 1969, the narrative becomes even less focused, but the particulars of their tumultuous relationship, and of the widowed Joan’s apotheosis as a major American philanthropist, remain absorbing. They met in 1956 when Ray walked into the swanky St. Paul restaurant where Joan played the organ to try and sell a McDonald’s franchise to her boss. Vivid thumbnail sketches of their respective backgrounds make it easy to understand the attraction between two restless people who shared a passion for music and a fondness for being the center of attention. Napoli’s cogent, albeit hardly new, summary of fast food’s connection to the postwar zeitgeist (“Quick plus cheap equaled the backbone of the new American Dream”) underscores how shortsighted the McDonald brothers were in blithely handing off the right to franchise their name and assembly-line food production methods to Kroc for a mere 0.5 percent of gross sales. Joan’s boss purchased a franchise and hired her husband Rollie as the manager. This gave Ray an excuse to spend time with Rollie’s wife, who was impressed by the ferocious ambition her sweet, reliable spouse lacked. But something must have told Joan that Ray would be a lot harder to deal with; it took her five years to agree to marry him — in 1961, the year he finally bought out the McDonalds — and only five weeks to back out. 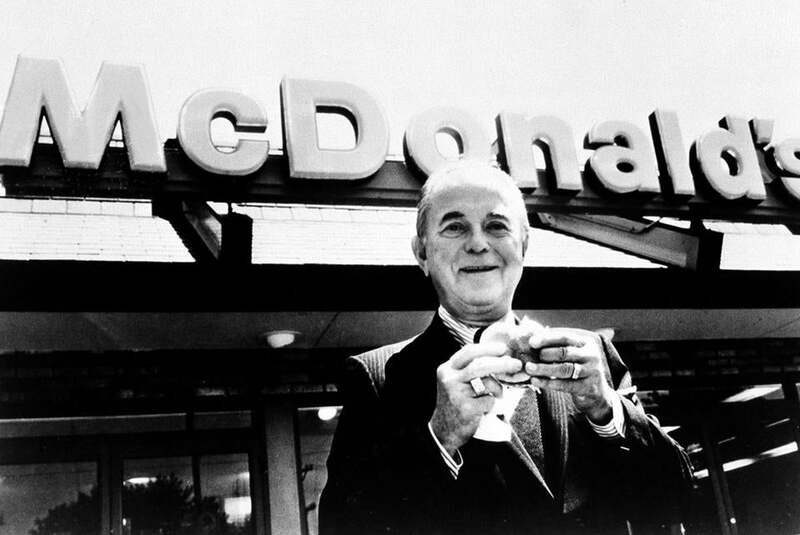 By the time she said yes again nearly eight years later, McDonald’s had become the first fast-food company to go public, and Ray had become a multimillionaire. In that same period, Ray dumped his long-suffering first wife, the stunned second wife he married on the rebound from Joan’s initial rebuff, and the McDonald’s financial officer who masterminded the stock offering that made him rich. It couldn’t have been a surprise to her that Ray was mercurial, but it wasn’t until after the wedding that Joan realized his volatility was linked to alcohol abuse and could lead to physical abuse. She filed for divorce in 1971, then called if off two months later. Napoli’s one-sentence explanation (“As hard as it was for them to live together, it seemed, Joan had decided they shouldn’t be apart.”) is regrettably characteristic of her tendency to skate over the surface of her subjects’s psyches with just enough perceptiveness to inspire the wish that she would go deeper. Napoli weaves together the Krocs’s personal and business dramas with considerable intelligence, undercut by her tendency to ricochet bewilderingly around the chronology of events. She shows Joan channeling her frustration with Ray’s refusal to acknowledge his drinking problem into a foundation that worked to increase public awareness of alcoholism, pointedly contrasting this very personal charity with Ray’s calculated donations to burnish McDonald’s corporate image. After he died in 1984, Joan was free to spend her vast inheritance on whatever she chose, including “peace centers” and anti-nuclear proselytizing that would have infuriated her conservative spouse. Napoli’s portrait of Joan in her final two decades, impulsively writing multimillion-dollar checks and dispatching her private jet “like a pickup truck” to run personal errands for friends, is charming and engaging. It’s also meandering and occasionally baffling, as when she speculates of the agnostic Joan’s warm relations with such “holy souls” as Jimmy Carter, Father Theodore Hesburgh, and Fred Rogers (yes, the children’s television star), “Did these friendships fortify her from her own transgressions?” The transgressions are unspecified, the friendships’s ability to “fortify” Joan from them unclear, the author’s weakness for cloudy metaphors painfully evident. Nonetheless, this strong-willed, mismatched couple’s odyssey is so inherently fascinating that “Ray and Joan” survives its scattershot presentation. Wendy Smith, a contributing editor at The American Scholar and Publishers Weekly, reviews books for the Los Angeles Times and The Washington Post.